When Will the Luddites Ever Learn? Two Oxford University professors, Carl Benedikt Frey and Michael Osborne, wrote back in 2013 that the robotic revolution would overtake and virtually displace human workers in broad expanses of U.S. industry. Those occupations most at risk include loan officers (98 percent chance of being replaced by a robot), receptionists and information clerks (96 percent), paralegals and legal assistants (94 percent), retail sales people (92 percent), taxi drivers and chauffeurs (89 percent), and fast food cooks (81 percent). At the bottom of the list are elementary school teachers and physicians and surgeons (0.4 percent chance), lawyers (4 percent), musicians and singers (7 percent), and reporters and correspondents (11 percent). Two other college professors, this time from the University of Redlands, California, decided to take the Oxford study and apply it to American cities with more than 250,000 workers. They concluded that cities like Las Vegas, El Paso, Texas, and Bakersfield and Riverside, California were the most at risk, with Las Vegas topping the list: 65 percent of jobs currently held by people will be held, they estimated, by robots by 2035. Pretty much everyone will be affected, but some metropolitan areas will see a lot more jobs vanish than others…. This looks like especially tough times ahead for Vegas and the Inland Empire. But even though there may be a few winners, pretty much every region in the US is going to get a haircut. Robots wouldn’t be employed if they didn’t reduce costs, improve performance, or both. That’s what’s been happening since 1760, the start of the Industrial Revolution, and it’s discouraging to learn that these Profs were still stuck in the 18th century. That’s when Ned Ludd decided to destroy the machines that threatened his livelihood. Since then, of course, the Industrial Revolution has done nothing but improve enormously the welfare and standard of living of nearly every living soul on the planet, reducing poverty even in the worst countries significantly. What’s surprising is not the kiosks invading fast food restaurants and robots building Toyotas, but the invasion into legal services, knee replacements, and floor trading. Behind the scenes, robots are replacing paralegals as they are much more efficient at reviewing and processing the thousands of legal briefs and precedents their bosses need for pre-trial research and development. Fast-food cooks can see the handwriting on the wall, with a company called Miso Robotics selling “Flippy,” a computer-driven robot that learns how to cook a burger, when to flip it, when the temperature indicates that it’s ready, flips it once again onto as bun, adding sauce and condiments along the way. Miso Robotics isn’t alone. Its peers include Zume Pizza, Café X, Makr Shakr, Frobot, and Sally (automatic pizza, lattes, cocktails and milkshakes, frozen yogurt, and salads, in case one missed the connections). Greg Creed, the CEO of Yum! Brands (KFC, Taco Bell, Pizza Hut, Wingstreet) said his company will be replacing workers with robots by the mid-2020s, likely hastened along by minimum wage laws increasingly being adopted by states. Other examples include robots like da Vinci, helping surgeons do prostate removals and hysterectomies. Currently da Vinci has more than 4,000 of its robots in place in surgical labs across the country. This writer is intimately familiar with one of them. Medical technology giants Stryker and Smith & Nephew are developing robots to do complete knee replacements, resulting in less patient trauma and recovery. They allow for precise positioning, accurate guidance for bone cutting, and highly efficient insertion of artificial bone joints. Banks and investment companies have been using robots to automate back office tasks for years, but UBS has installed “adaptive strategy” software that helps traders trade more efficiently by learning strategies as the market changes and then implementing them. Its investment results so far are impressive: returning more than 10 percent in environments where index funds were showing returns of half that. What’s persuasive about the claims that robotics don’t replace people so much as they displace them, moving them to difference jobs where their skill sets make them a better fit. According to the U.S. Bureau of Labor Statistics, U.S. companies added 136,748 robots to factory floors over the past seven years. If each of them displaced the average of 5.7 human jobs, that would have led to massive unemployment. And yet, over that same period of time 894,000 new manufacturing jobs were created instead. And for those who are temporarily replaced by a robot and given a pink slip and a “nice to know ya” on the way out the door, the free market is already providing them educational and training options in robotics and software coding. There’s even a robot coding school offered by Scott Blanck, called Start Code, for young children wanting to get a head start. There are night schools with classes in robotics and coding as well, not to mention new classes on maintenance and repair of the millions of robots coming online. And, there’s generation Z, which not only is measurably more socially and politically conservative than the one in front of it, it is populated with young people not only familiar with the new technology but are preparing themselves for the day fast approaching when robots will be doing the hard and dangerous labor. This will allow the Zers to indulge in the things that interest them and pay them better than flipping burgers. Having lived through the Great Recession and seeing what their parents went through, they are turning out to be much more interested in providing for themselves than those in the generation ahead of them. 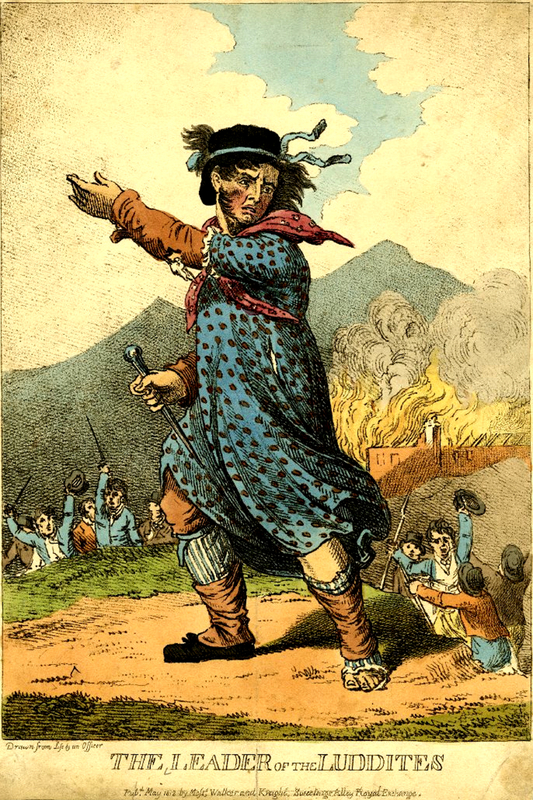 The term Luddite is a pejorative, and not perfectly accurate in describing what Ned Ludd did back in 1789, and why. But it has been replaced by the term Progressive, which reflects an interest in turning back the clock to days when work was harder, the air was dirtier, and people lived shorter and more difficult lives. Whatever, the free market continues to ignore the charges and the warnings of professors like those in Redlands who really ought to get out more. They’ll be surprised to learn that robots are making life easier, cheaper, and better for millions, and will likely continue to do so for the foreseeable future. Fox News: Can robots create jobs for humans? This entry was posted	on Tuesday, July 11th, 2017 at 5:25 am	and is filed under Free Market, History. You can follow any responses to this entry through the RSS 2.0 feed. You can leave a response, or trackback from your own site.